These simple Easter Bunny Cupcakes make a great Easter activity fo the kids! Both regular and Thermomix instructions included. Although there is no doubt that Easter recipes are normally ALL about the Chocolate (and not that there is anything really wrong with that!) it’s also nice to enjoy something a little different. These easy Easter Bunny Cupcakes are made using a yummy vanilla cupcake as the base and they are then topped with a light buttercream. To decorate, you simply cut a marshmallow in half to use as the bunny’s ears and then pop a pink smart on for its nose – too easy! 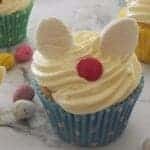 These Easter Bunny Cupcakes are just perfect for the kids to decorate in the lead up to Easter and they also would make the perfect Easter dessert. You can make the cupcakes a day or two in advance if necessary and then just simply store them in an airtight container until you are ready to decorate them. When making the buttercream, please don’t be alarmed by the quantity of ingredients, you want to have more buttercream than normal to ensure each cupcake has a lovely thick layer to create the bunnies ‘face’ and also lets face it, if the kids are helping you put these together, they will probably want to taste test some of the icing along the way too! The time it takes for your cupcake mixture (and also your buttercream mixture) to combine can be impacted by the temperature of your butter. It’s best to use butter which has been bought to room temperature for this recipe. You can also use icing sugar mixture for the buttercream. These vanilla cupcakes can also be frozen (before they are decorated) for up to one month. You can make these cupcakes a day or two in advance before decorating them. If you are looking for more easy Easter recipes to make with the kids, you might like to check out these Easter Bunny Biscuits too. This easy Easter Bunny Cupcakes recipe makes a great Easter activity for kids. Both regular and Thermomix instructions included. Preheat your oven to 180 degrees celsius and line a 12 hole muffin tin with paper cases. Place the softened butter, self raising flour, milk, vanilla extract and eggs into the bowl of an electric mixer and mix on medium speed for 3 minutes or until the mixture is smooth and creamy. Spoon the cupcake mixture into the prepared muffin tin and bake for 20 minutes or until the cupcakes are golden and cooked through when tested with a skewer. After 5 minutes, carefully transfer the cupcakes to a wire rack to cool completely. Sift the icing sugar into a small bowl and set aside until needed. In an electric mixer, beat the butter until it’s pale and creamy. Transfer your buttercream into a piping bag with a star tip and pipe the top of the cooled cupcakes. Cut a marshmallow in half for the Easter Bunny ‘ears’ and place on top of the each cupcake add then add the pink smartie ‘nose’. Continue until all of the cupcakes have been decorated. You can then store these cupcakes in an airtight container until needed. These cupcakes can be made a day or two in advance and then decorated when desired. You can also freeze the undecorated cupcakes. This easy Thermomix Easter Bunny Cupcakes recipe makes a great Easter activity for kids. Both regular and Thermomix instructions included. Place the softened butter, self raising flour, milk, vanilla extract and eggs into your Thermomix bowl and mix for 10 seconds, speed 5. Scrape down the sides of the bowl and mix for a further 5 seconds, speed 4 or until the mixture is pale and creamy. Place the softened butter into your Thermomix bowl and mix for 30 seconds, speed 2. Scrape down the sides of the bowl and mix for a further 20 seconds on speed 3 or until pale and creamy,. Add the icing sugar and vanilla extract and mix for 15 seconds, speed 3. Scrape down the sides of the bowl and mix for a further 20 seconds, speed 3 or until the buttercream is smooth and creamy.